Update: This survey discussed in this story was apparently a hoax. You can read more here. A comprehensive study of web users has determined that the dumber you are, the more likely you are to use Microsoft Internet Explorer. After measuring the IQs of exactly 101,326 users and correlating their scores with the browser they had used to access the test, "There was a clear indication ... that the subjects using any version of Internet Explorer ranked significantly lower on an average than others," concludes the study, conducted by the Vancouver, Canada, psychometric-assessment firm, AptiQuant. At the other end of the scale are those oh-so-brilliant Opera users, followed close behind by users of Camino and Internet Explorer with Chrome Frame. "There was no significant difference in the IQ scores between individuals using Google Chrome, Mozilla Firefox and Apple's Safari;" AptiQuant writes, "however, it was on an average higher than IE users." The methodology of the study appears sound. English-speaking users from the US, Canada, UK, Australia, and New Zealand were drawn to a free IQ assessment test on AptiQuant's website either organically through unprompted search-engine results or through advertisements. Before being given the test, subjects were asked their age and gender; subjects under 16 were redirected to a different site, and their data was not used in the test. Each subject's browser and operating system were detected and retained along with their scores on the well-respected Wechsler Adult Intelligence Scale (IV) IQ test. Those results were then compared with the results of a similar study done in 2006 – and the results weren't pretty for users of Internet Explorer versions 6 through 9. 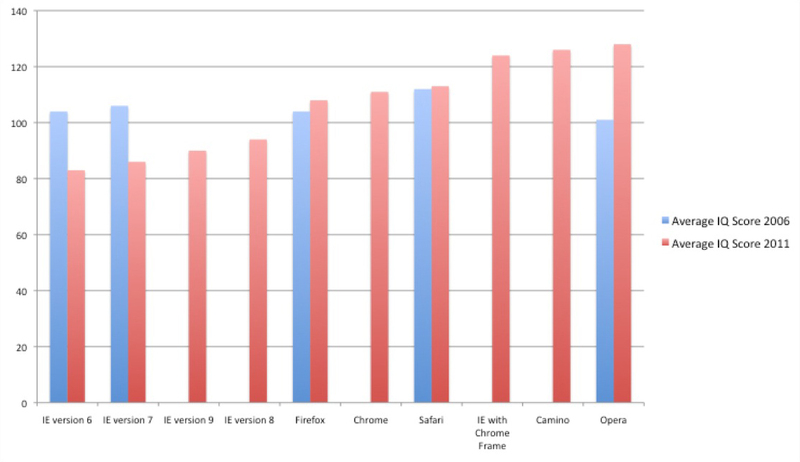 If anything, IE users appear to have gotten duller over the past five years, and Opera users, sharper. "The comparison clearly suggests that more people on the higher side of IQ scale have moved away from Internet Explorer in the last 5 years," AptiQuant concludes. AptiQuant also plotted the use of each browser over the range of users' IQ. IE users again embarrassed themselves: the higher the IQ percentile, the fewer IE users. On the other hand, the smarter the user, the more likely they were to use Opera, Camino, and IE with Chrome Frame. The study – "Intelligence Quotient (IQ) and Browser Usage: Measuring the Effects of Cognitive Ability on the Choice of Web Browser" – had a loftier goal than merely insulting IE users and putting a smile on the face of Opera's development team: to gauge the correlation between the resistance to changing or upgrading software, and users' IQs. "From the test results, it is a clear indication that individuals on the lower side of the IQ scale tend to resist a change/upgrade of their browsers," the study concludes. "This hypothesis can be extended to any software in general, however more research is needed for that, which is a potential future work as an extension to this report."